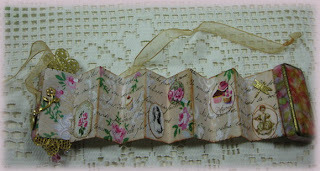 Holly Moore is having a "Altered Domino Mini Book" swap in the M.A. group. She did a Tutorial on ideas how to make them. 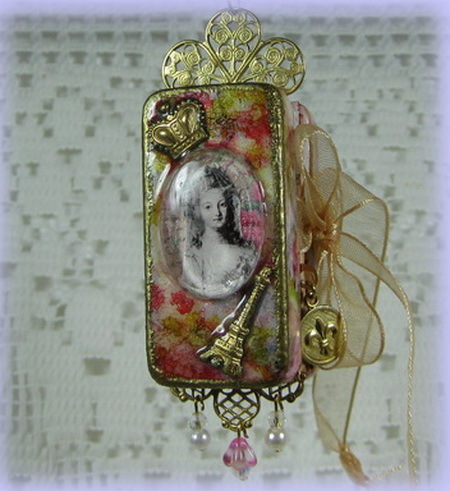 This is what I made I used alcohol inks for the background, using a image of Marie Antoinette and a clear Cabochon over the image. I added some metal filigree with beads and a charm. I coated the domino's with "Diamond glaze" to give it a glass like finish. I love doing mini books with domino's letting inspiration lead the way to doing something different each time. The inside of my book is pages in an accordion style. A gold ribbon to close the book. 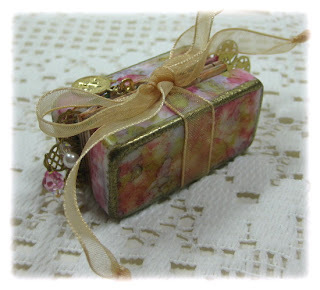 I embossed with gold embossing powers, using a heat gun to melt and set the edges, giving it a elegant textured look. Thanks for stopping by today! Wow,I love it.You are very creative.I need a lesson on how you do it. I would love to learn how to do something like this too! Just beautiful! I would LOVE to swap with you! 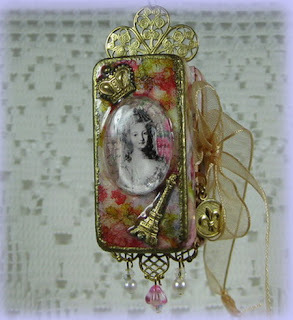 I do mixed media art, including altered domino collages. I also write poetry, I'm going to choose a poem to swap in a domino book fashion TODAY! I LOVE your little book! Thanks so much for sharing!